For all the cooking experience I have accumulated over the years, desserts have been the most elusive in my kitchen. First of all, I’m not exactly the biggest consumer of sweets, and then there is the fact that although Renata loves desserts, it’s not like we are going to consume a whole coconut vanilla wafer cake or an egg custard pie by the time it loses its freshness. But I do love making sweets, even though I rarely get to actually prepare them. Among my favorites are the aforementioned cake and pie, upside down cake (with pineapple) and Brazilian desserts that remind me of the good times I spent with my grandmother in Fortaleza, Brazil. Grandma Adalgiza was naturally thin and could eat everything she wanted, but as I remember she hated her slender figure and kept trying to gain weight. 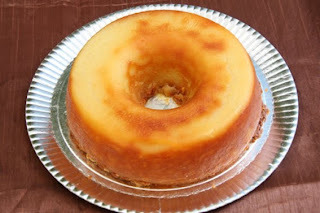 She also didn’t like skinny people around, so whenever we (the grandkids) were in the house, the fridge would be filled with classic northeastern Brazilian goodies like bolo Luis Felipe (a very moist cake that combines coconut and cheese), condensed milk pudding and pretty much anything rich and sweet. One story I remember well was when I was going out with this very skinny girl, and when I took her to my grandma’s home she took one look at her and next thing I know she’s force-feeding her cake and avocado smoothie (very popular in Brazil). This might seem like a familiar Brazilian trait of hospitality, but when it came to my grandmother, she always wanted everyone to be content and full – even if as a result some of those now-grown grandchildren (myself included ) struggle with their weight. But what can I say? Those were delicious – if fattening – times. In a medium, heavy saucepan, dissolve the sugar in the water, then heat over medium-high heat until the syrup reaches the “thread stage” (temperature 225F-235F on candy thermometer, or until the syrup drips from spoon, forming soft threads in cold water). Remove from heat, add the butter and salt, and let cool completely. Beat the egg whites to the “soft peak” stage, and then gently beat in the yolks, one at a time, until you have a consistent mass. Fold in the flour, 1/2 cup at a time, alternating with the coconut milk and the grated cheese. Finally, fold in the cooled syrup. Generously butter a ring-shaped cake pan, and dust with flour. Pour the batter into the pan, place in a preheated oven, and cook for approximately 50 minutes to one hour, or until a toothpick inserted in the cake comes out clean. This recipe sounds amazing! I’m going to try it soon and will let you know how it comes out.